If you’ve noticed an increase in people walking around with their heads buried in their cell phones, you can blame Pokémon GO, a new game that has taken most of the world by storm. And your nonprofit can benefit from it! Pokémon GO is a mobile app (Apple, Android) game that sits on top of Google Maps. When playing, it looks just like Google Maps, with a few more interactive elements. Players can pursue Pokémon: imaginary cartoon animals (yeah, I know), capture them and keep them as digital pets. Players can also train and duel (non-fatally) with their Pokémon against other players. The game is being praised for getting people off their couches, exercising and interacting with others. Individuals struggling with mental health issues or with social disorders are reporting the game as therapeutic. It’s also driving foot traffic to businesses; something that few augmented reality apps have been able to do. While the game can be played anywhere – in a neighborhood or a park – structures like buildings and sculptures can house either Gyms or Pokéstops: places where players can interact, pick up items or enhance their characters. That’s where nonprofits come in. For organizations that rely on in-person visitors, like museums, aquariums, theatres, art galleries, gardens, camps, etc., your physical location may already be an attraction to players. This adds a new incentive for visiting your location, or a way for you to introduce yourself to those already wandering towards you. Many restaurants, bars and other retail establishments are soliciting new and return visitors in the same way. 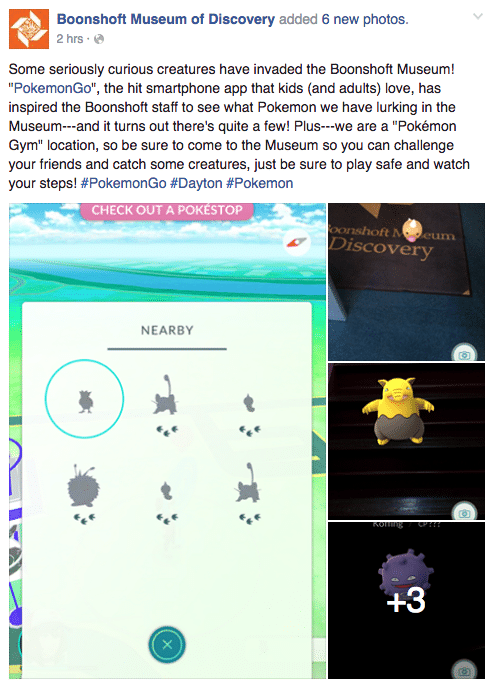 A good way to get started would be to download and open up the game while at your organization’s location to see if you are or around any Gyms or Pokéstops. Even if you aren’t, the game can be played just about anywhere (including in-doors). Museum Hack has a great write up on how museums specifically can leverage the game. Crystal Bridges Museum of American Art in Bentonville, AR has published a blog post encouraging patrons to come and play the game. Is this a fad? Maybe. These things tend to burn white hot for a short time then go away forever (see also: ice bucket challenge). But it’s important to keep in mind that Pokémon is a 20+-year-old worldwide brand with a very loyal community. As of 7/11, the app is about to overtake Twitter in terms of daily active users. So capitalize on the foot traffic while you can! Just don’t go too crazy. Shift all your fundraising budget across to Pokemon Go now. Personally, I’ve had a blast playing with my four-year-old son. Have you seen other nonprofits jumping on the Pokémon GO bandwagon in an effective or meaningful way? Let me know in the comments below! UPDATE: You can request your location become a PokeStop and/or Gym in Pokemon Go. (Thanks to the Nonprofit Happy Hour Facebook group for many of the examples in this post). I can’t wait to see what creative ideas we all come up with!